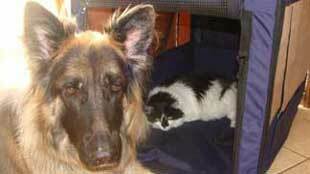 I would like to submit this humorous photo of my Psychiatric Service Dog (PSD) and companion cat NuNu, for your GSD Monthly Contest. Dakota takes her duties as a PSD VERY seriously! Even when we are at home, she keeps a close eye on me. But I always make a concerted effort to play with her, take her to the park and let her do “doggie” things to relieve any stress she might have. Unfortunately, her favorite way to de-stress is to play with her 21pound, ex-feral cat, NuNu. Kota will drop toys on him, trying to get him to play with her. They are very good friends. When NuNu has had enough of the roughhousing, he retreats into Kota’s crate, where Kota can’t drop things on him. So while NuNu sleeps the day away, Kota pouts outside the crate and sighs heavily, hoping he will wake up and come out to play some more. Judges, I know you will be inundated with pictures of glorious looking GSD’s for this contest. And while my Kota DOES fit in that category, I wanted to submit something completely different in the hopes of catching your eyes – and this is a occurrence that happens almost daily! Kota and NuNu, her 21# ex-feral 16 year old cat are pretty good buds. They sleep near each other all the time. If Kota wakes and NuNu isn't there, she immediately searches the house to find him. NuNu also likes to sleep in Kota's regular comfy crate, much to her dismay. She goes in and tries to lie down too, but can't because NuNu has taken up the best part. So Kota licks him and backs out,then lies down at the entrance, staying alert until NuNu awakes - which could be hours - and licks him as he comes out. Kota then goes in the crate, lies down,then comes out to see if NuNu is available for Kota to drop a toy on to get him to play with her. Aren't dogs supposed to chase cats away? Why doesn't that big dog go in and force the cat out? The dog could lay on him - and I bet it never happens again!